This anonymous artist of the generation of Hans Memling derives his name from an altarpiece in the Sint-Jakobskerk in Bruges, with scenes of the life of that saint. Notable within his oeuvre are his depictions of the Virgin and Child with saints, such as the example in the Detroit Institute of Arts of The Virgin and Child with Saints Barbara, Catherine, Cecilia and Ursula. The figures are located in a rose garden that refers to Paradise and to the cult of the Virgin of the Rosary. The city in the background has been identified as Bruges, despite including numerous monasteries and churches that do not exactly correspond to real ones in the city. The presence of one of the towers in that view, however, has enabled this composition to be dated to around 1480. 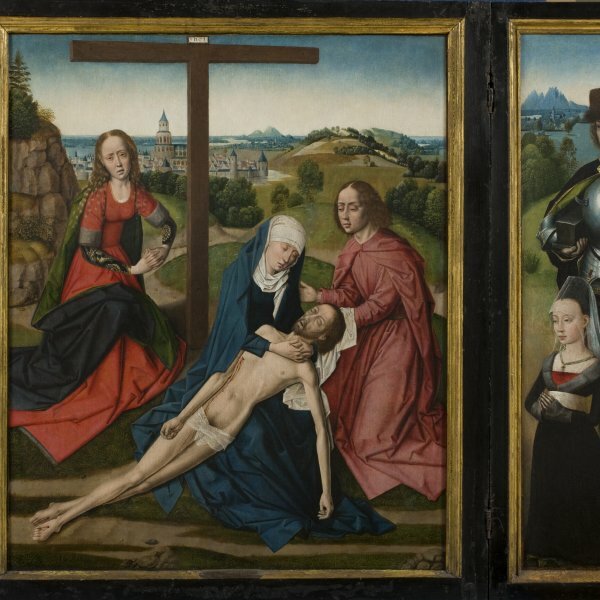 The Pietà Triptych (Museo Thyssen-Bornemisza, Madrid) has also been attributed to this painter and again features buildings based on the city of Bruges. The style of the Master of the Saint Lucy Legend combines the influence of the great Netherlandish masters such as Van Eyck and Van der Goes with that of Memling in the approach to the composition, iconographic types and careful rendering of the backgrounds and landscape. In addition, some Spanish influence has also been noted and it has been suggested that the artist travelled to the Iberian Peninsula. Ann Roberts identified this painter as Jan de Hervy, who died before 1512.